Good news to all Reliance Jio users as Jio has now annouced a surprising cashback offers for its users. The Jio has cut down the effective price of JioFi portable 4G router that was Rs 999 to 499. Under this amazing offer, the customers will get cashback of Rs 500, due to which the JioFi device price cuts down from Rs 999 to 499. In 2017, Reliance Jio had cut the price of the portable router from Rs 1, 999 to Rs, 999. To avail this offer, users need to buy a new JioFi device. Those who already have the device are not eligible for it. 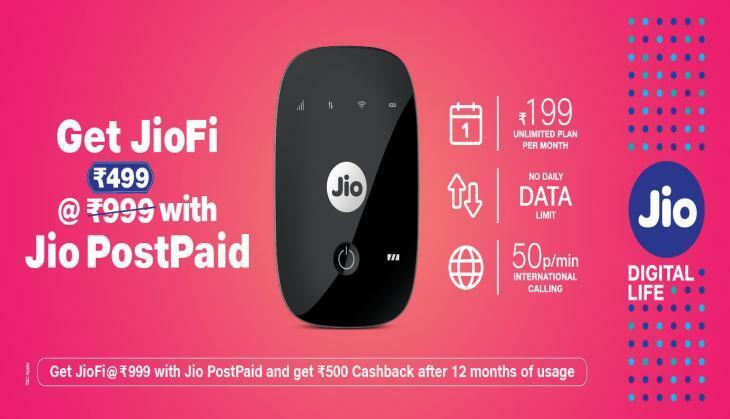 To avail the JioFi cashback offer, users requires to buy a new postpaid SIM that will be used in it. They must opt for minimum of Rs 199 value postpaid plan for 12 months atleast. After every 1 year period is over, hey will get Rs. 500 cashback in the form of credit which will be adjusted against the next bill cycles. For those unaware of the plan, Jio postpaid plan at Rs. 199 offers 25GB of data and free voice calls, unlimited SMS messages, and premium subscriptions to Jio apps to consumers. The offer is effective starting from July 3, and there is no last date revealed so far. Users can purchase the JioFi datacard from Jio Store, as well as e-commerce websites such as Amazon and Flipkart, among others. Grab this amazing offer of Reliance Jio and stay tunned for more upcoming details.